We must define our effort not as a boundless “global war on terror,” but rather as a series of persistent, targeted efforts to dismantle specific networks of violent extremists that threaten America. … As our fight enters a new phase, America’s legitimate claim of self-defense cannot be the end of the discussion. To say a military tactic is legal, or even effective, is not to say it is wise or moral in every instance. For the same human progress that gives us the technology to strike half a world away also demands the discipline to constrain that power — or risk abusing it. I assume you already know the basics, which have gotten 24/7 coverage. A side issue is whether or not we can blame global warming. In general, as the planet warms there is more heat in the ocean and more moisture in the atmosphere, creating the potential for more violent storms. However, from year-to-year or even decade-to-decade, the tornadoes in one particular area are subject to a lot of other factors. the science on tornadoes and climate change isn’t clear enough to OMFG about it just yet. Here’s my rule of thumb: Am I willing to accept the validity of this measurement if it turns against my favored theory in the future? In other words: If for the next year or two the number and severity of tornadoes in Oklahoma goes down again, will I feel like global warming is refuted? My answer is no, which means I shouldn’t put too much stock in the global-warming/tornado connection now. On the other hand, I would reconsider if the Earth had a genuinely cold year — colder than the 100-year average — with no obvious event like a major volcano to explain it. So when April turned out to be the 338th consecutive month with an average global temperature above the 20th-century average, I thought that was significant. In other words: If you’re 28 or younger, you’ve never experienced a globally cool month. Thursday at the National Defense University, President Obama recognized that American democracy can’t survive an endless global war. I summarize in “This War Must End”. As no trail to the White House emerges and the scandal hinges on how the regulations define 501(c)(3)s and 501(c)(4)s, you have to wonder: What Happens to a Scandal With Boring Details? Prediction: The mainstream media will lose interest, but the conservative media will invent whatever exciting details it needs to keep its audience aroused. 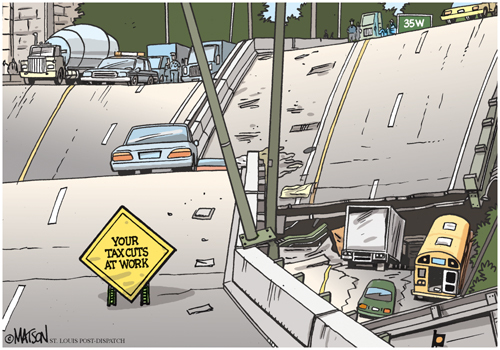 The cartoon is actually a reaction to the 2007 bridge collapse in Minneapolis, but nothing has really changed. Which bridge will go down next? New York Magazine suggests that it could be one of the busiest bridges in the Northeast: the Tappan Zee. Since no one died this time, I don’t think I can be accused of “politicizing the tragedy” to point out that President Obama’s American Jobs Act of 2011 included $50 billion for infrastructure improvements. It could not overcome a Republican filibuster. The proposal has been back every year since, and is now part of Obama’s 2014 budget proposal. It’s entirely legit for Republicans to wonder how the necessary work will be paid for, but it’s not legit to just block Obama’s proposal. If Republicans don’t offer an alternative infrastructure plan, then their plan is to keep watching our bridges fall down. I can’t remember a week where atheism popped up in so many stories. Catholics believe that it is only in Jesus Christ that this salvation is conferred, and through Christianity and the one Church that it must be mediated to all people. Tuesday, Representative Juan Mendez delivered a secular humanist invocation to begin a session of the Arizona legislature. I would like to ask that you not bow your heads. I would like to ask that you take a moment to look around the room at all of the men and women here, in this moment, sharing together this extraordinary experience of being alive and of dedicating ourselves to working toward improving the lives of the people in our state. I want to remind the House and my colleagues and everybody here that several of us here are not Christianized. I’m a traditional Navajo, so I stand here every day and participate in prayers … This is the United States, this is America, and we all represent different people … and you need to respect that. Your God is no more powerful than my God. We all come from the same creator. The Oklahoma Freethought Convention is selling “I’m actually an atheist” t-shirts. Proceeds will help Vitsmun rebuild her home. Blitzer’s clumsy interview points out the amount of religious propaganda we take for granted whenever natural disaster strikes. (Funny how nobody on TV ever says, “The randomness of this destruction reinforces my belief that sometimes stuff just happens and you can’t take it personally.”) Slate’s Mark Joseph Stein called out the tunnel vision in ABC’s reporting of the “miracle ending” at Briarwood school, where no children died. The families and friends of the seven children who died at Plaza Towers would not consider this ending really all that miraculous. God’s mercies are curiously selective. Toplady, the author of “Rock of Ages,” moved from one vicarage to another; a week after the move, the vicarage he had formerly occupied burnt down, with great loss to the new vicar. Thereupon Toplady thanked God; but what the new vicar did is not known. Last week I talked about how Jonathan Karl’s dishonest journalism on Benghazi briefly made it look like there really was a White House cover-up. It turns out we should have seen that coming. Two years ago, Fairness and Accuracy in Reporting (FAIR) had him pegged as a “right-wing mole at ABC News“. He comes out of the same conservative program that gave us Ann Coulter, Dinesh D’Souza, Michelle Malkin, Rich Lowry and Laura Ingraham. Words you never thought you’d read here: Go, Jan Brewer. This “shocking news” about ObamaCare is good news: The California exchanges are offering healthcare policies for less money than expected. Tuesday, Apple CEO Tim Cook testified to a Senate committee about the tricks that allow his company to make many billions of dollars and pay very little tax in the U.S. or anywhere else. The business-news blog Quartz has a good summary of the problems in corporate tax law and how Apple abuses them. After a British soldier was hacked to death in London Wednesday, Glenn Greenwald raised this question: Is there any reasonable definition of the word terrorism that includes this act, but not U.S. drone strikes in places like Pakistan or Yemen? Can it really be the case that when western nations continuously kill Muslim civilians, that’s not “terrorism”, but when Muslims kill western soldiers, that is terrorism? … Once you declare that the “entire globe is a battlefield” (which includes London) and that any “combatant” (defined as broadly as possible) is fair game to be killed – as the US has done – then how can the killing of a solider of a nation engaged in that war, horrific though it is, possibly be “terrorism”? What could be cooler than a solar airplane? To really get a sense of what science is up against on the climate front, one should really spend the time to watch a ‘debate’ on the subject that took place at Duke Univ. last November between Bill McKibben and Alex Epstein. This is an eyeopener, and pretty distressing for those that harbor a glimmer of hope that mankind can stop its lemming-like rush to cliff’s edge.